Apple is all out of displays. If you purchase a Mac Mini or a Mac Pro you’ll need to buy a 3rd party monitor to go with it. They no longer make any monitors. It might not sound like a big issue, but this is a failure on all 3 points of the original Apple marketing strategy of 1977. Let me explain why. When Apple was first formed in 1977 their 3 fold marketing strategy that saw them become the best computer company in the world. This strategy encompassed 3 ideas: Empathy, Focus and Impute. Here is how Steve Jobs explained them. 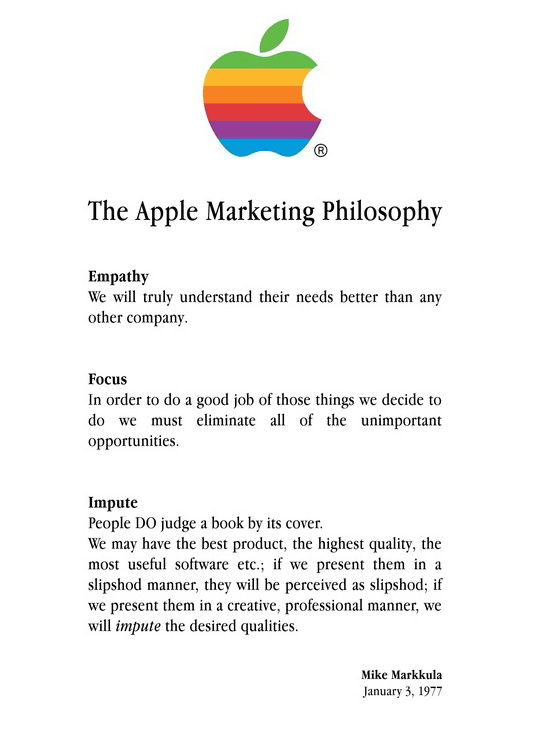 Apple works by making the whole process off using a computer best for the customer – Empathy. No “compatibility” problems, no driver incompatibilities, no complicated purchase decisions to make. True plug and play before Windows even invented the term. Now it’s broken again. Now you can no longer control the display brightness from your keyboard because 3rd party monitors don’t talk to the Mac about brightness. Now you may end up with a monitor that doesn’t even display colours properly on your Mac. The genius of Apple’s interpretation of ’empathy’ is that Apple doesn’t do what the customer thinks they want. Apple does what Apple knows the customer wants. For example just this week I plugged a third party Chinese lead into my iPhone only to be greeted with a message on the screen informing me that Apple was not going to let the charger charge my iPhone with that lead. That’s not what I wanted. Or was it? Apple knows that in the long run, what I really want is a reliable charging cable. It’s bad for me to use a cheap one. Even if I think I want to. And so, for my own good, they won’t let me use another one. This time it’s the opposite – this time Apple think it’s best for you NOT to use their hardware. That is what Apple means by ’empathy’. This is why Apple abandoned the floppy drive and the optical drive before users were ready. Apple knew what was best for the user. But this time there is no new alternative technology. This time it’s the opposite – Apple think it’s best for you NOT to use their hardware. The average user has no idea about what kind of display will be best. It’s a matter of doing some research. This might sound like a strange thing to complain about because that is how every other company works. You go and research the product. But that is not how Apple works. Apple have built a name that people trust. But now they are undoing that. Why do Apple trust you to purchase a 3rd party monitor, and a 3rd party router (they have announced the discontinuation of their routers) but not a 3rd party charging cable? Apple either don’t know what’s best for the user any more or they don’t care. Either way, it’s a lack of empathy. Apple either don’t know what’s best for the user any more or they don’t care. Either way, it’s a lack of empathy. Which brings me to the second point of the Apple marketing strategy. Apple has also lost Focus. Focus is about eliminating the lots of unimportant things so as to do a good job of the important. To have one good home computer. One good Phone. And to not get distracted by other things. Apple currently has 4 models of iPad, 5 models of iPhone, 6 iMacs, 11 laptops, 2 TVs, I’m not sure how many watches, and rumors of a car. Oh – they also have a Mac Pro and a Mac Mini – both with no display. Where’s the focus? It may be that Apple are moving out of desktop computers that have seperate displays. They might think that just having an iMac is better for the user. But if this is the case, why are they still selling the Mac Mini and the Mac Pro? What is Apple’s focus? Apple have an ad hoc lineup that doesn’t make sense. A Mac Pro that hasn’t had an upgrade in 3 years. A Mac mini which is slower than the 2012 version it replaced. And now both of them have no display. Focus is about eliminating the lots of unimportant things so as to do a good job of the important. Apple need to focus. Focus doesn’t necessarily mean doing less. It means working out what is important, doing that, and saying no to other things. Not half doing things. The final strategy – impute. Apple has always been concerned with aesthetics. A good user experience. Steve jobs articulated from an early age the importance of a computer having good quality all the way through. Even the packaging should impute a sense of quality. This was so strong in the past that Apple forced you to use only their displays by having their own custom display adapters. Then we had a period where Apple tolerated you using alternate displays. Now the only option is to use a non-Apple monitor. It’s a massive turn around. I rang Apple about what display to buy to go with a Mac Mini or Mac Pro and their advice was to buy a third-party display. This experience imputes a sense of anti-quality. It imputes the sense that Apple is no better than anyone else. The display is the only part of your computer that you look at all day. You will now be staring at a Dell logo and a flimsy plastic monitor support. This experience imputes a sense of anti-quality. It imputes the sense of Apple being no better than anyone else. Leadership by committee can devolve into pursuit of profits, negating the original vision. We always return to the source documents to revive us.